If you decide you don’t want the productivity features of Bells & Whistles, simply choose to uninstall it: when prompted, choose to “Repair” the installation, remove the Bells & Whistles add-in and you can keep the free Outlook add-ins manager! To get the Outlook Add-ins Utility, simply download & install the trial version of Bells & Whistles for Outlook. 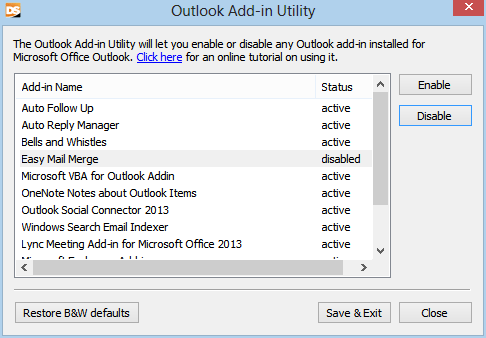 To enable or disable an Outlook add-in, simply select it in the add-ins list and click on the right sided Enable / Disable buttons. When you are done managing your Outlook add-ins, make sure you exit the free Outlook add-ins manager window using the Save & Exit, otherwise your changes will be lost. Please note that you will have to restart Outlook for the add-in changes to take effect. I disabled B&W and now I cannot get it to re-enable. Every time I close Outlook and reopen, it puts it in the inactive folder. I uninstalled and reinstalled and it is still not showing up in my tabs as an option. HELP!